What can I say about this week's TWD recipe? Adjectives like stupendous, delicious, and drool-worthy all spring to mind. 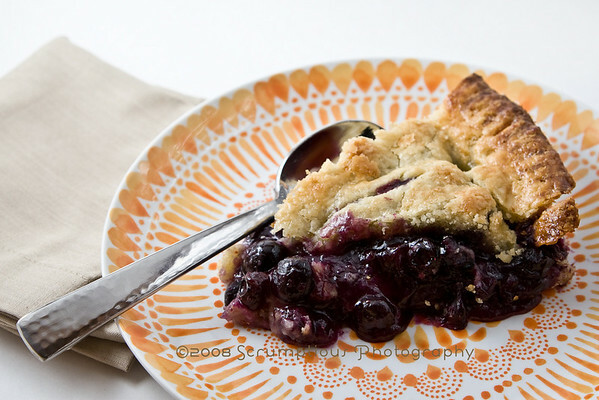 Amy of South in your Mouth chose Dorie's Double Crusted Blueberry Pie, and it was amazing. Seriously. A little piece of heaven in pie form. Admittedly, I was extremely hungry by the time I finally got to taste a piece of this pie, since it took FOREVER to make. However, there were many less-biased raves from A. and his coworkers saying that it was, and I quote, "friggin delicious". 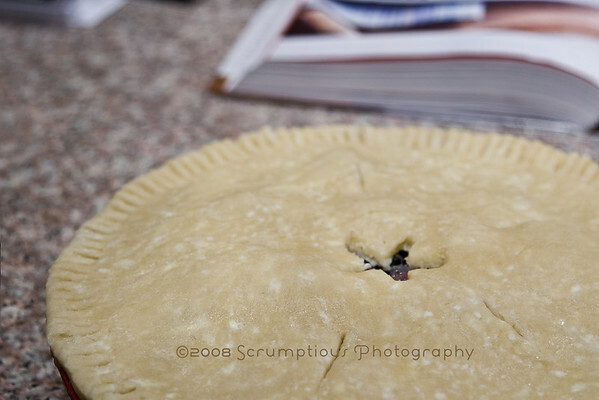 The filling was gooey, and pie crust was actually pretty flaky, despite my complete mishandling of it. I'd never made a pie crust before, other than the tart crust from a month ago, and that was a completely different texture. So this whole "flaky/tender" juxtaposition was a bit of a new challenge for me. 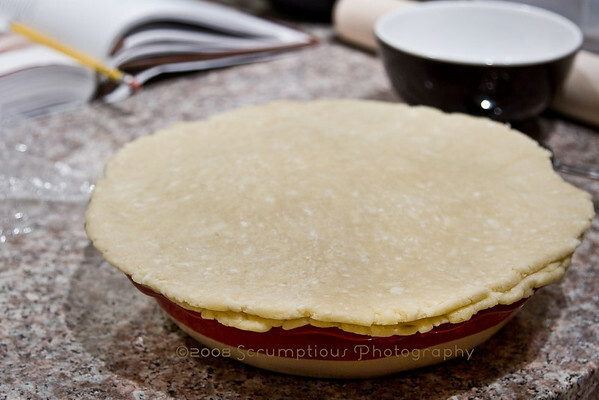 Dorie's solution is to use part shortening, part butter for the fat in the crust. The shortening was easily the most controversial ingredient this week. 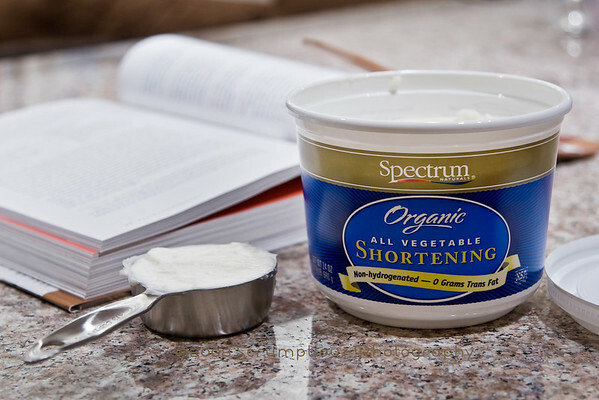 I used this palm oil shortening, which claims to be all-natural with no trans fats. I think some people opted for lard here, some went for all butter, and some went Dorie's route with the shortening. Let's all just admit that there's no way this is going to be healthy, and move on. 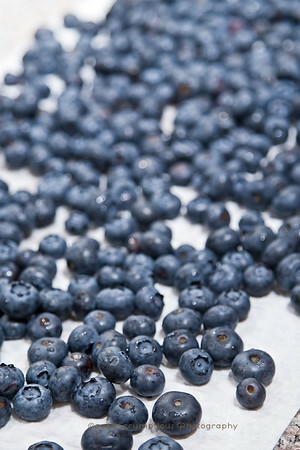 At least there were a lot of antioxidant-rich blueberries -- 2 cups, which I weighed out to be around 700g of blueberries. It actually looked like pie dough... very relieved. The other controversial ingredient was the layer of bread crumbs underneath the filling. I just used some plain, store-bought bread crumbs, which were fine and I didn't really notice them at all. As I've said before, my apartment is always on the warm side, so it was a bit difficult keeping all of the crust ingredients cool. 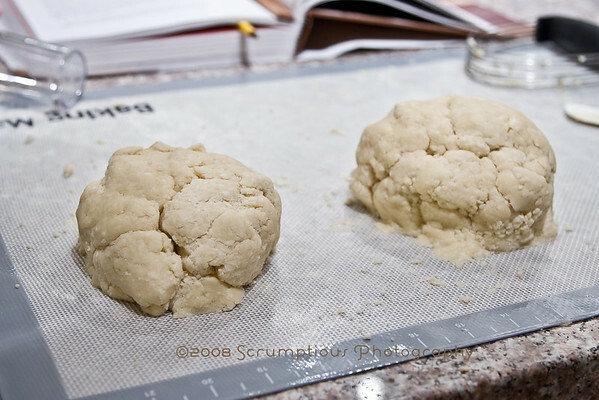 I think I took a little too long rolling out the dough, because the fat was starting to get a little melty. Also, I forgot to keep flipping it, and there ended up being some wrinkles on the other side from the plastic wrap. Once it was rolled out, it was time for more chilling. Our fridge was already bursting with too many jars of half-eaten salsa, so it did not take kindly to sheet pans being balanced precariously inside. After much cursing and screaming, I eventually managed to get the crust sufficiently chilled and the pie assembled. In the end, the pie came out great! I did end up using the suggested aluminum foil tent halfway through because the edges browned up too fast. It didn't solve the problem, but I guess it might have ended up even darker without it. Don't forget to check out the blogroll for the rest of this week's entries! The recipe is available in Dorie's book. Loved your whole entry. Your photos are amazing. Your photos are superb and I love your sense of humor, too. I always have trouble making room to chill the pie, too, and it always ends up balancing precariously on top of other things. Only on cooking shows is there lots of room in the fridge! "Adjectives like stupendous, delicious, and drool-worthy all spring to mind." 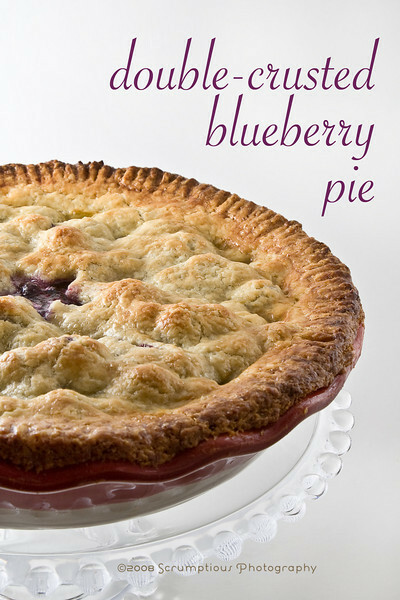 Those words come to my mind as well, after looking at your blueberry pie for this week's TWD recipe - yum!! Your photos are wonderfully deliciously amazing looking! Fantastic entry. As always I am impressed! Great looking pie, about the rim I am green with envy, it looks professional. 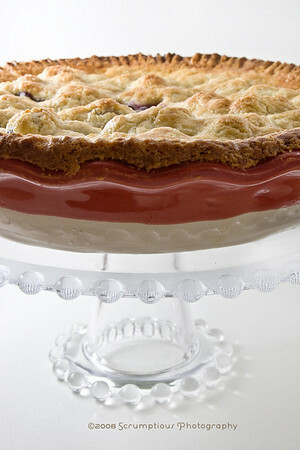 Beautiful pie, it looks delicious! Your pie turned out great, and your photos are fabulous! And I completely agree that pie crust is not a "health" food. Funny that something this simple was so controversial. Beautiful pie! I love the photos and the entry! Talented writer, photographer, and baker! Triple threat! beautiful pie. I love the star cut out in the middle! @ulrike - the blackcurrents sound delicious! 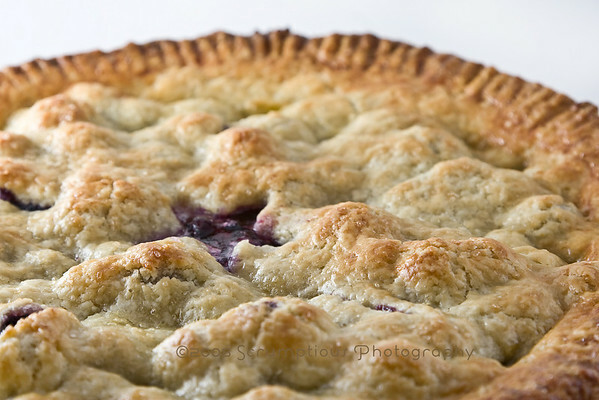 Your pie and pictures look amazing! Great job. Oh and I am totally trying those mint brownies soon! Wow! 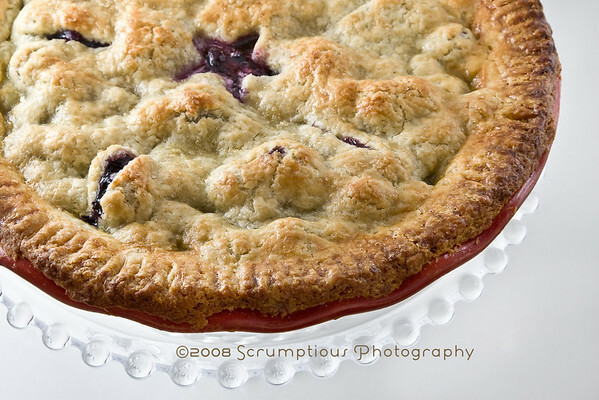 Great looking pie, love your photos! 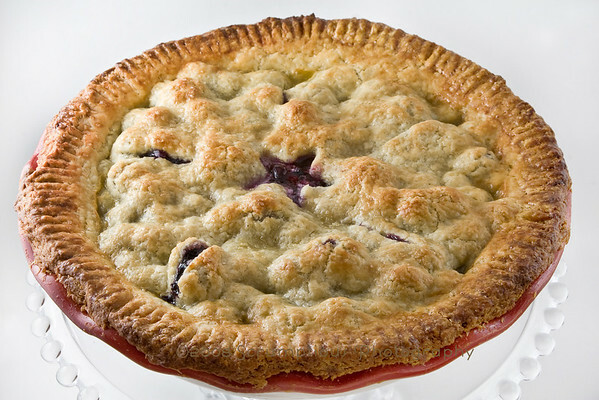 Your pie looked terrific, and you did a wonderful job on your first crust! I want your hobnail cakestand!! as always, you leave me wanting to lick the screen, and then go out and buy a new camera. great job!! Your pie looks so much gooier then mine! I could eat another slice, right now! p.s. 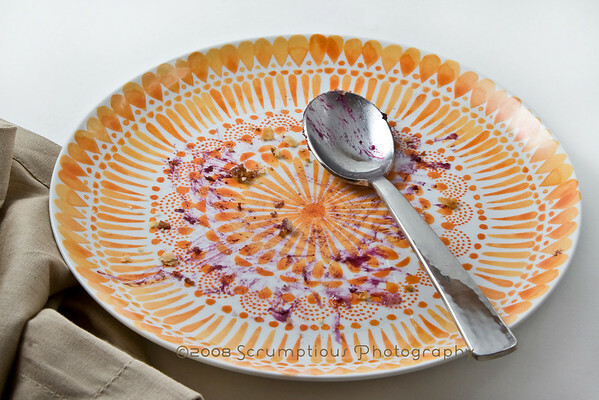 Your pie plate is to die for...jealous. me oh my, that is one gorgeous pie. (i'm a poet and didn't know it.) i have no doubt it was "friggin delicious" and well worth the time and effort. lovely. I love the way your crust looks. Very nice. Your photos are beautiful! I wish I could take pics like you do. I am so impressed! Very fun...and the photos are beautiful. You really have a knack for photographing and posting and telling a story. Thanks for sharing. That is one beautiful pie! The photos are gorgeous! I agree that this pie did take a long time to make, but it was worth it. Yours looks beautiful and delicious! Hey, the pie in that last picture looks just like mine! As always, great photos and even better looking finished product! Dark crusts are the best! It's not suprising the whole thing was eaten. I love your photos. WOW, WOW, WOW! 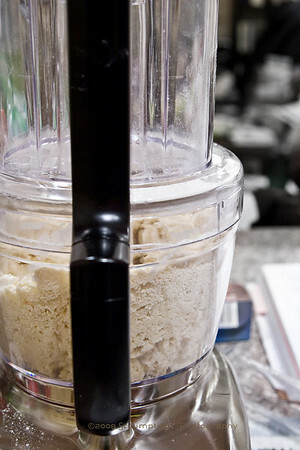 !...your photos are gorgeous, and it's even more impressive that you take these beautiful pix as you are baking. fantastic job! Mmmmm, great post! Love all the pics. I had the same experience with the aluminum foil and the edges getting too dark. Ah well, I don't eat that part anyway, lol. oh my gosh! Fab photos and your pie just looks scrumptious...HA! I think "friggin delicious" sums up this recipe pretty accurately. Beautiful job! What a beautiful pie! Your photos are gorgeous. I love the one of the filling coming out. It looks delicious! Gorgeous pie! And your star looks like a star. I'm jealous. A lovely pie! Obviously your dough did just fine although the kitchen was warm. Regarding the shortening controversy, I am wondering if Crisco is good - I heard they had made it healthier than before. As always, your photos rock! Great job! great post. insanely awesome pictures!!! Your photos are spectacular! 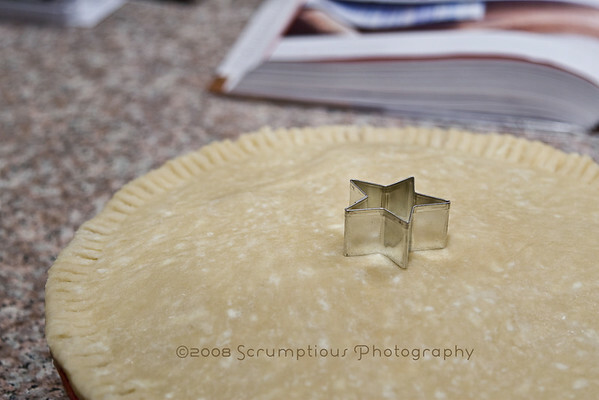 I love the star cut out in the pie. Great job!